Live Pads lets to play live sessions on the way with 8 assignable pads for Line-Progression-Jam, and change between them by pressing or MIDI In. Each Pad has a triple combination: Bass Line, Progression and Jam Intensity. 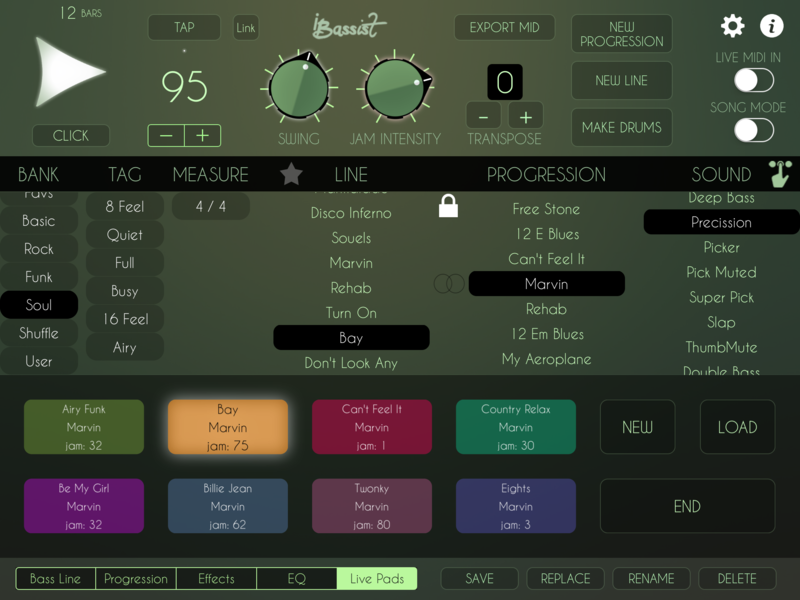 When a Live Pad is selected, bass line, progression and jam will be setted at the next change ( Progression by default ). Live Pads Changes are selectable in the setup, so you can configure it to change Directly, Bars, Bass Line or Progressions. 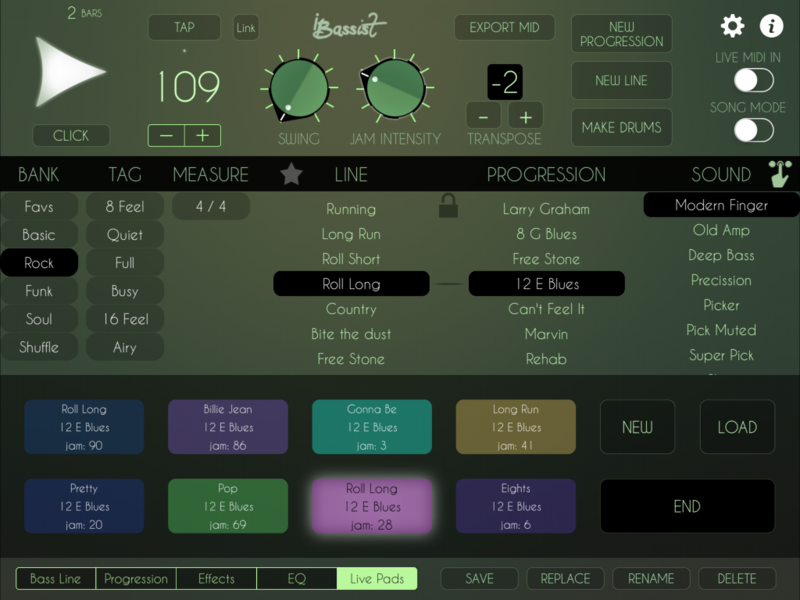 To set a Live Pad make a Long Press on it and will store the current selected bass line, progression and Jam Intensity. Make sure the bass line and progression are previously stored. 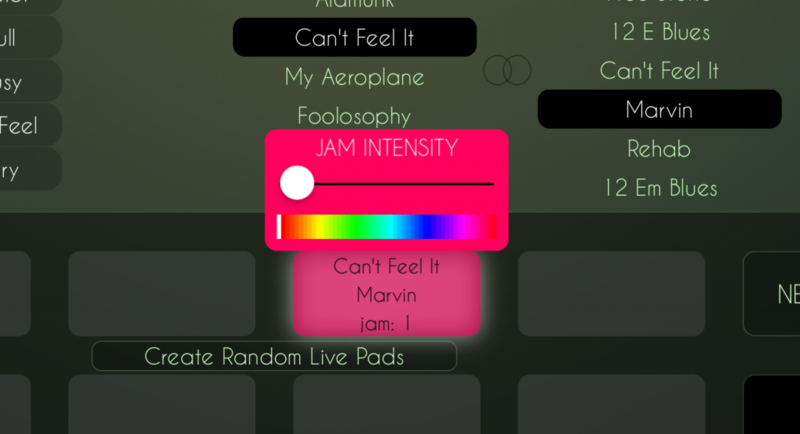 Create Random Live Pads button will set all empty pads with the current progression, random Jam Intensity and lines with similar styles as the current one ( lines with similar tags ). Make sure the bass line and progression are previously stored, so it will not work when the progression or line isn’t stored. When you are ready, press Save button to store. Be sure you have the Live Pads editor selected in the bottom section. Save button always work with the bottom section.